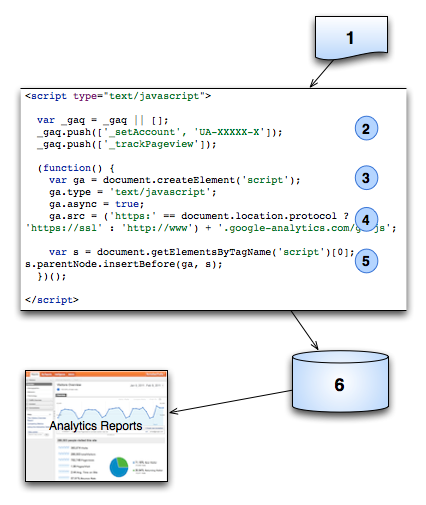 Google Analytics is enabled by including a tracking code in the template of your website. This way, Google’s indexing bots can see every page of your site and tell you all kinds of information about the traffic you’re receiving on those pages. By the way, Google allows you to add IP addresses to a filter in your analytics account so that your numbers are not skewed by your own traffic on the website.It would be a real bummer to go on thinking your website is crazy popular because you spend hours clicking through it every day. Google provides GA (google analytics) service by which web master can analyze the web traffic on his web site. Like who visited, from where, for how much time, at what time etc. Once you enable it, you can see it graphically on the google analytics server on the real time basis. It is very simple to consume this service, just create one account with http://www.google.com/analytics/ and take the account tracking token for that account. Put the tracking token in base web page of web site you want to be tracked or analyzed and you are done. “Know your visitors” is the key behind creation of GA service. Once a web site is up and running, it is really important to get a sense of users by tracking their activities. It helps in making important decisions based on users locale, likings, timings etc.